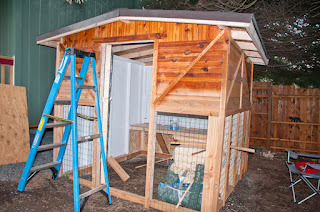 We finally got the chicken coop done and painted and even decorated. Looks cool I think! It ended up being more complicated than we thought… I guess things usually are. We haven’t really had many problems. We have been trying to decide if we should stay with straw on the ground or go with wood flakes. 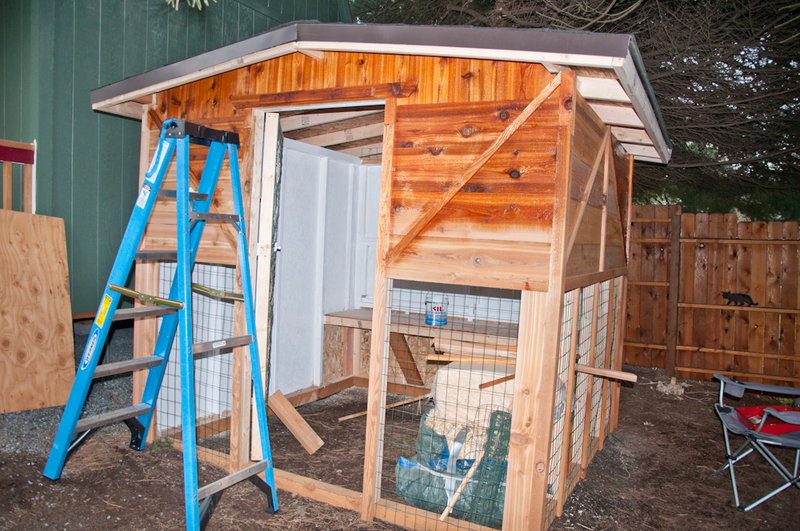 So we did get three adult chickens from our friend (the one who built the coop!). Here is a picture of them and our dog. Our dog isn’t quite sure what to make of them yet. She did bark and growl a little at the beginning. Then a few days ago she chased a local cat away from them and had a great time running around the yard chasing this cat…and now she seems to be a little protective of the chickens. We haven’t let them out yet to free range… but I plan to. And eventually I will try to incorporate the dog and chickens. 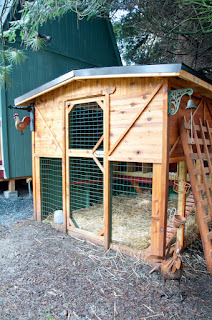 I do have to say I found the Backyard Chicken website to be fantastic and helpful (http://www.backyardchickens.com/). Update: I spent a lot of time painting the inside of the coop. Let me tell you – dont waste too much time painting as chickens will crap over everything. Really. I have read that a layer of paint inside is useful for deterring mites so I am glad I did it. But that pretty coop is not longer pristine. Between the chicken poop, the spiders and the dusts there is no way this coop will even look as good as it did 10 minutes before the hens entered! Also, the dog ended up being completely fine with the chickens. The rooster we eventually got did his macho rooster thing to the dog every now and then but the dog thought that was his invitation to play. But the dog has never hurt the chickens. In fact our neighbors for a while has a chihuahua that could slip under our fence. 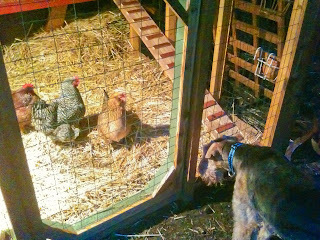 It barked at the chickens but then two of the hens chased the dog off the property and its never been back!